It’s a big week for TV shows on Blu-ray. We already mentioned The Walking Dead: The Complete First Season is Amazon’s Blu-ray Deal of the Week. Today, The Walking Dead: The Complete Second Season hits shelves. The box set includes audio commentaries, webisodes, deleted scenes, and 10 never-before-seen featurettes. There’s also a special Limited Edition boxed set that comes packaged in a zombie statue created by McFarlane Toys. 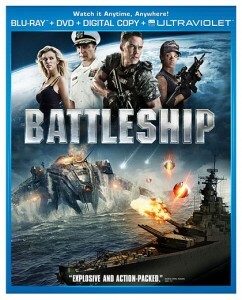 Universal’s Battleship also hits shelves today. The Blu-ray edition includes one BD, DVD, Digital Copy, and UltraViolet access code to download from the cloud. Several titles from Universal’s 100th Anniversary hit shelves today such as Airport, Scarface, and Out of Africa — all of which contain a Blu-ray, DVD, and Digital Copy. Other mentionables this week: Sons of Anarchy: Season Four; Starship Troopers: Invasion; The Lord of the Rings (all three extended editions available to purchase individually). As always, here’s a link to all new Blu-ray, 3D, and UltraViolet releases this week.